We were in Aviemore, Scotland in August of 2015. I got some good pictures of the train from that bridge – and some photos of the engineer backing the train up. We were able to get tickets for a train leaving in about 15 minutes. For the way up to Broomhill, we sat near the front of the train. We’re “train people” and this trip didn’t disappoint. The steam train went through Boat of Garten and turned around at Broomhill. It was interesting at Boat of Garten when a couple bike riders stopped and took pictures of us – while we were taking pictures of them. It was a nice, relaxing trip and I slept most of the way back. We saw River Spey again, sheep, cows, old rolling stock, people on bikes. Join us for a truly memorable trip through the heart of the Scottish Highlands, in the stunning surroundings of the Cairngorms National Park! Explore the areas along our line further and discover exactly why the Victorians brought a railway line to this unique area in the 1800s! It’s roughly 15 minutes of train travel between each station, with a full return trip lasting between 90 minutes and 2 hours (depending on which Station you start your journey at). You can split your journey up if you wish! Take the morning train in to Boat of Garten and explore its stunning surroundings and take the last train of the day back in to Aviemore! 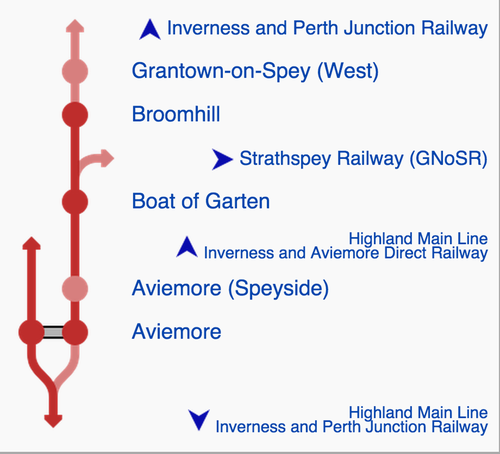 The first departure point along our 9 and a half mile line is Aviemore (we’re at Platform 3 of Aviemore Station!) It’s located in the heart of the Monadhliath and Cairngorm Mountains and is the perfect base for those that love the outdoors and glorious sights! Once the train takes you past the modern architecture of the town, we steam you through heather-clad moores and woodland and alongside the majestic River Spey. 5 miles away lies our second station at Boat! As you enter Boat of Garten (also known as The Osprey Village) you will see one of the area’s finest courses at Boat of Garten Golf Club, originally built by locals and railwaymen! The RSPB observation hide at the Osprey Centre lies just 3 miles from the village and it’s certainly worth a visit during summer, when these magnificent birds return from the warmer climates of Africa! There are also plenty of walk and cycle trails, perfect for families, couples or groups exploring the area! The newly opened 1896 Gallery and Cafe is also definitely worth a visit! Be sure to stop off and have a look! 5 miles of glorious steam travel from Boat heading north brings you to our Broomhill Station, the current terminus of our line. The Station originally served the nearby villages of Dulnain Bridge and Nethy Bridge on the original Great North of Scotland Railway line. The forests in this area offer real diversity – there’s plenty of wildlife and nature to explore here! And the views from Broomhill are AMAZING! Make sure you get off the train at the Station, get some fantastic scenic pics and meet your engine driver, fireman and get some photos on the footplate! Our unique heritage railway boasts an incredible history and our line was the first to come to the Scottish Highlands, back in the mid 1800s. The future of our Railway is also of great importance! We’re working very hard to realise the railway’s dream of returning steam trains to Grantown on Spey!